Into Silence by Simon Bull Belgian tapestry shows the artwork of modern floral artist Simon Bull. 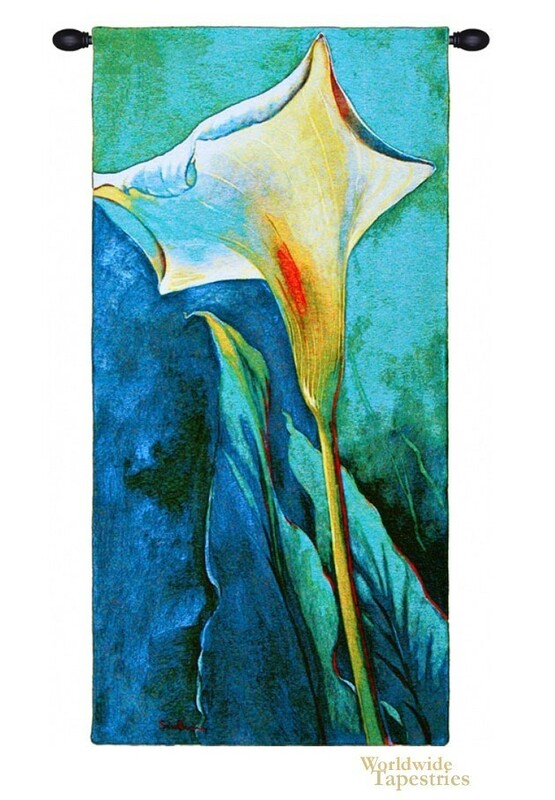 Here we see a white lily illuminated to show yellow and golden hues, on an aqua blue and turquoise background. Simon Bull, from London, England has travelled through countries including South America and Hong Kong. His works are tremendous in their use of color to evoke a sense of emotion and in the moment attention to the floral subject. This Into Silence tapestry is backed with a lining and a tunnel for easy hanging. Note: tapestry rods and tassels, where pictured, are not included in the price. Dimensions: W 26" x H 53"